Tiny books, called dwarsliggers in the Netherlands, are the size of a cellphone and feature extremely thin pages that a reader can flip horizontally as if scrolling. When I was a kid, I loved the Golden Book collections that the publishers miniaturized. I still have the set I got for my own children, and I notice that my grandchildren are drawn to the surprising size. So I’m guessing that a kind of tiny book already popular in Europe is going to take hold in the US, not just with kids. Alexandra Alter writes at the New York Times, “As a physical object and a feat of technology, the printed book is hard to improve upon. Apart from minor cosmetic tweaks, the form has barely evolved since the codex first arose as an appealing alternative to scrolls around 2,000 years ago. “So when Julie Strauss-Gabel, the president and publisher of Dutton Books for Young Readers, discovered ‘dwarsliggers’ — tiny, pocket-size, horizontal flipbacks that have become a wildly popular print format in the Netherlands — it felt like a revelation. “Dutton and Mr. Green are hoping that younger readers from a generation that grew up with the internet and smartphones might be receptive to the concept of a miniature flipbook. More at the New York Times, here. I expect that one-handed reading will improve life in crowded subways, where commuters are likely to need the other hand just to hold on. The plastic bicycle path in Zwolle, the Netherlands, is a test for building roads from plastic waste in the future. I don’t know if it’s because, historically, they’ve had to protect their land from the encroaching sea, but the Dutch seem to be repeat innovators. This blog has covered a lot of new ideas from the Netherlands. (3-D printed houses, anyone? Wind power for trains?) Today’s post is on a possible use for discarded plastic bottles. Daniel Boffey writes at the Guardian, “The world’s first plastic bicycle path made of recycled bottles, cups and packaging has opened in the Netherlands, as part of a pilot that could see similar roads open up across the country. “The 30-metre path, made of recycled plastic equivalent to more than 218,000 plastic cups, is expected to be three times as durable as an asphalt alternative. It also contains sensors to monitor the road’s performance, including its temperature, the number of bikes that pass over it and its ability to cope with the traffic. “The prefabricated sections of cycle path are light and hollow making them easy to transport and 70% quicker to install. Cables and utility pipes are able to be easily fitted inside, and the path is designed to drain off rainwater. … It is believed that many of the benefits of the paths will apply to plastic roads. The idea has real possibilities, but the concerns of groups hoping to end the use of plastics altogether need to be addressed. “Plastic Soup has warned that small particles of the plastic could find their way into the living environment due to heat, wear and run-off.” More at the Guardian, here. I’m just glad people are trying to find solutions to some of the damage that human activity has done to the planet. The issues are in the news right now as both great powers and small, climate-impacted countries are meeting in Katowice, Poland, to improve on the Paris Agreement. By the way, if you are on twitter, do follow Sweden’s 15-year-old climate activist Greta Thunberg (@GretaThunberg), who is speaking truth to power in Poland: “I will not beg the world leaders to care for our future. I will instead let them know change is coming whether they like it or not.” I just read that Venice is likely to succumb of sea-level rise. Greta’s urgency is warranted. Young people give me hope. And read a wonderful, inspiring book by former president of Ireland Mary Robinson called Climate Justice, which connects human rights and poverty to the effects of global warming and offers hope in the shape of brave, ordinary people. New homes in the Netherlands are being created with a 3-D printer. Now for something completely different: how those creative Dutch are using 3-D printers to create homes. 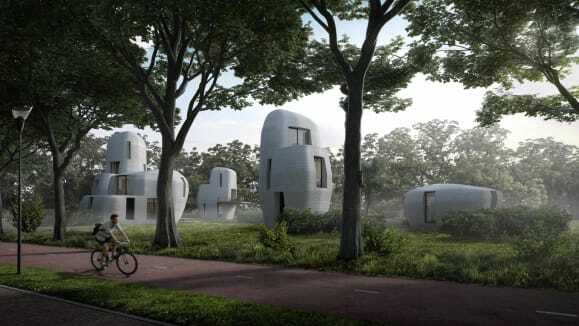 Gianluca Mezzofiore reports at CNN, “Living in a community of 3D-printed homes will soon be reality in the Dutch city of Eindhoven. “Working along with the Eindhoven University of Technology, the construction firm is printing a special type of concrete for the house’s exterior and inner walls by adding layer upon layer. For more pictures and details, go to CNN, here. A 3-D printer lays down layer upon layer of concrete for a new home. One of the calendars used in the Dutch prison system to encourage prisoners to help solve cold cases. Here’s a new twist on solving cold cases. It’s being implemented in the Netherlands, and I was going to say, “Trust the creative Dutch to come up with this idea!” But it turns out they got the idea from the United States. Daniel Boffey writes at the Guardian, “Prisoners across the Netherlands are to be issued with calendars for their cells featuring unsolved murders or disappearances as part of a drive by the Dutch police to crack unsolved cases. “The so-called cold case calendars will be handed to all 30,000 prisoners in the country after a trial run in five jails in the north resulted in 160 tips to the police. “The police say they can offer anonymity to people in certain cases. “ ‘There is no penalty for keeping information about a criminal offence committed. Therefore, you do not have to fear persecution if you have been sharing information, even after years of deliberation,’ they said. More here. Someone should study whether participating prisoners are motivated mostly by the reward, by boredom, by outrage at certain crimes, or something else. 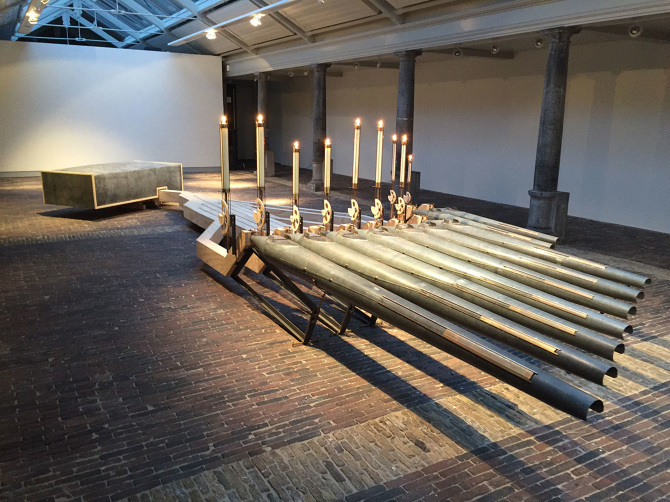 In January, this candle organ was on exhibit in the Netherlands. You may recall my January 2014 post about zebra finches playing instruments at a museum (here) and a December 2016 post on Croatia’s sea organ (here). The sea organ harnessed the tides to push water through narrow passages leading to organ pipes under marble stairs. How many ways there are to make music! So much need for music! Today’s post is about an artist who created a candle pipe organ. 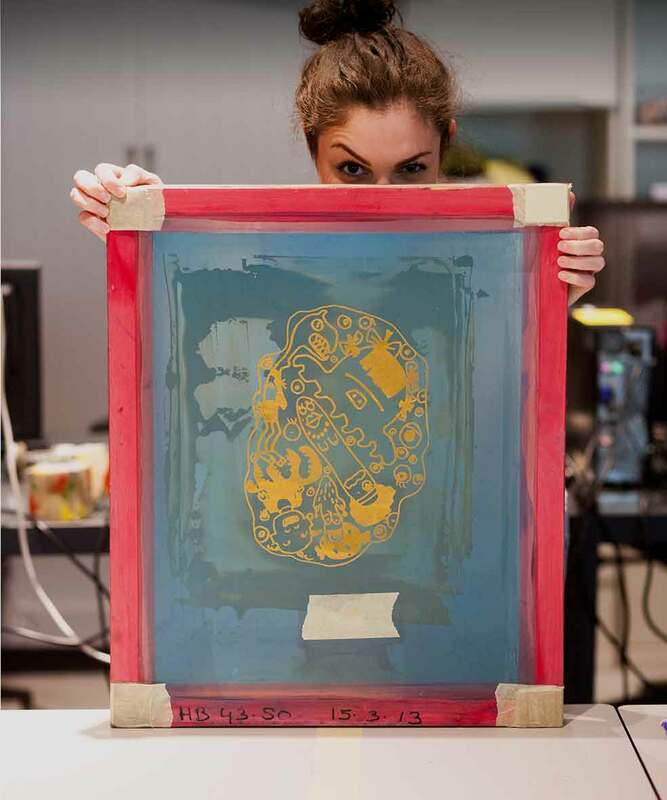 Lauren Young at Atlas Obscura explains. “There’s a curious low industrial hum emanating from what used to be a fish market built in 1769. At De Vishal gallery in Haarlem, Netherlands, a large nine-pipe organ operated by burning candles purrs a continuous concert. “In the video, Dutch artist Ronald van der Meijs shows his elaborate musical mechanism. Inspired by the Muller Organ housed at Grote Kerk church next to the gallery, the series of pipes looks like a massive artillery weapon connected to wooden beam air ducts. The intricate system requires careful maintenance — van der Meijs changes out the candles multiple times a day as they burn. “For the pipe organ, ‘the candles are the musicians,’ van der Meijs explains. The candles vary in size. As the wax melts, the pitch of each pipe shifts slowly and irregularly. The shortening of the candles causes a vertical movement in each mechanism, pulling a wheel connected to a brass valve at the front end of each pipe. Opening the valves allows for different toned pitches.” More. All Dutch electric trains are now powered by wind energy, the national railway company NS has said. “We in fact reached our goal a year earlier than planned,” said Boon, adding that an increase in the number of wind farms across the country and off the coast of the Netherlands had helped NS achieve its aim. “[Dutch electricity company Eneco] and NS said on a joint website that around 600,000 passengers daily are ‘the first in the world’ to travel thanks to wind energy. NS operates about 5,500 train trips a day. “One windmill running for an hour can power a train for 120 miles, the companies said. They hope to reduce the energy used per passenger by a further 35% by 2020 compared with 2005.” More at the Guardian, here. Meanwhile in London, researchers are looking into solar-powered trains. “The renewable traction power project will see university researchers look at connecting solar panels directly to the lines that provide power to trains, a move that would bypass the electricity grid in order to more efficiently manage power demand from trains.” More. I wonder what sounds solar- and wind-powered trains make. Can we still say choo-choo-choo and whoo-oo-OO with our grandchildren? And who will update Thomas the Train? Intercity train arriving at Leiden Central railway station, Netherlands.